Sheet pan dinners are an excellent way to cut back on the time you spend in the kitchen. In most cases, the whole meal is assembled in a sheet pan and baked in less than 30 minutes. For many sheet pan dinners, the vegetables and protein choice are arranged on a rimmed sheet pan, such as a jelly roll pan or a larger half sheet pan. Just prep the food and then slide the pan into the oven. You'll be free to prepare a salad, run a quick errand, or just sit back and relax. And in most cases, there are no other pans used, so clean-up is a breeze! It's easy to convert other recipes using this method. Consider baking a free-form meatloaf on the center of a sheet pan. Toss vegetables with a tablespoon or two of olive oil and seasonings and then arrange them around the loaf. Or add chicken parts to your favorite roasted root vegetables or Brussels sprouts. Pizza is another possibility. Fit the crust into the pan and layer it with your favorite sauces, toppings, and cheese. Add some of these sheet pan dinners and ideas to your recipe list. This chicken dinner is a winner! 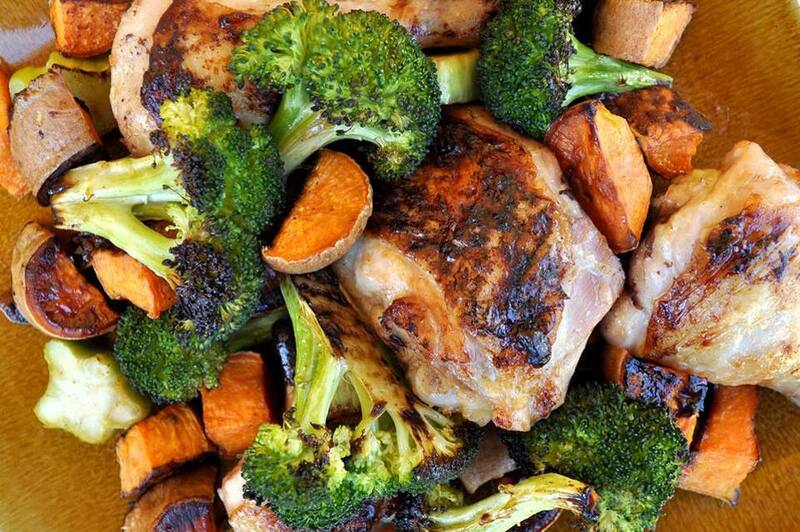 Flavorful, juicy chicken thighs team up with sweet potatoes and broccoli in this easy sheet pan meal. The chicken and vegetables get flavor from a sauce mixture of lemon juice, honey, and soy sauce. A combination of apricot preserves, lime juice, garlic, and seasonings make this chicken sheet pan dinner a meal to remember. Just chop the vegetables, arrange them on the sheet pan with the chicken breasts, and pop the pan into the oven. Lean pork tenderloin makes a complete oven meal when it's paired with root vegetables. Seasoned salt and Italian seasoning are the only pantry ingredients you need for this dinner. Add color and flavor with some salsa verde or fresh tomato sauce. This pizza is not crazy—it's amazing. The pizza bakes in a sheet pan with a soft biscuit-like crust. Use the suggested ground beef, sausage, and cheeses, or do your own thing. This pizza is a blank slate just waiting for your artistry. This roasted pork chop dinner is a cinch to throw together with briefly seared chops, apples, fennel, and carrots. Feel free to add some sweet potato slices to the pan if you'd like. 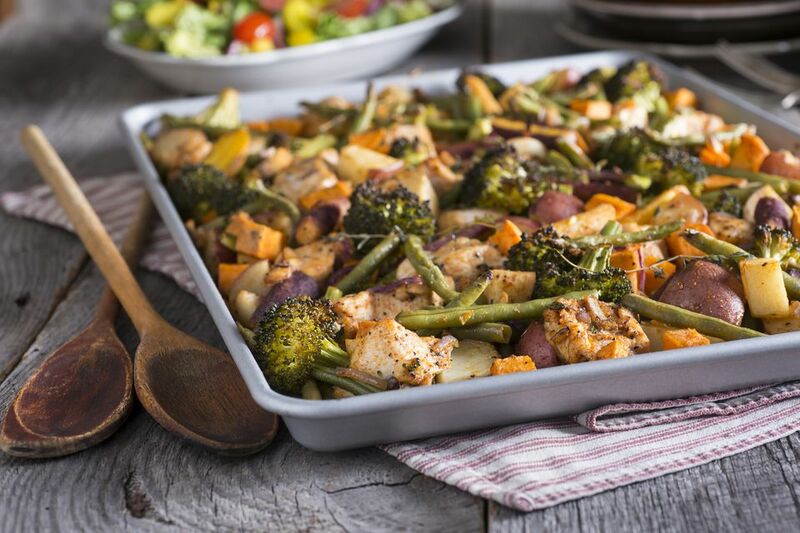 Harissa spice blend, olive oil, and lemon juice are tossed with the chicken and vegetables for this flavorful sheet pan dinner. If you don't have harissa, make it with a Cajun or Italian blend of herbs and spices, or use your favorite. Bosc pears, bacon, and Brussels sprouts make this one-pan chicken thigh meal as attractive as it is delicious. A mixture of honey and mustard makes a tasty glaze for the chicken. This delicious pan quiche includes ground beef, eggs, and two kinds of cheese. Pie pastry—homemade or two refrigerated crusts—makes up the crust for the quiche. The quiche makes an excellent breakfast, brunch, lunch, or dinner dish. Homemade bread dough forms the crust for this filled focaccia-style sandwich. The big sandwich bakes in a half sheet pan with a filling of ham and cheese. The sandwich makes an excellent breakfast, lunch, or dinner dish, or make it for a party. Use a large baking or roasting pan or sheet pan to bake this chicken dinner. Potatoes, carrots, and celery are among the vegetables, while red and green bell peppers and onions add extra flavor and color. Boneless chicken breasts make this a light and easy sheet pan dinner. A combination of fresh herbs, lemon juice, and olive oil ensure that the meal has plenty of flavor. A boneless leg of lamb makes a delicious one-pan dinner with root vegetables, garlic, and a variety of herbs. The lamb is marinated with a garlic and herb paste to ensure the most flavorful meat. It takes very little prep time, but plan to begin at least an hour ahead of time to give the marinade time to flavor the lamb. This Greek-style lemon chicken dish makes a fabulous sheet-pan dinner. The dish calls for a cut-up chicken, but whole legs or thighs can be substituted. Add a Greek salad for a delicious Mediterranean meal! Transform this colorful fall dish of roasted vegetables into an all-in-one sheet pan dinner with the addition of cubed extra-firm tofu, chicken pieces, pork chops, or chickpeas. Feel free to add sliced pears, dried cranberries, and onions. Sweet plantains and pineapple make these roasted salmon fillets next-level. Enjoy the salmon with a salad or cooked rice for a wonderful meal.